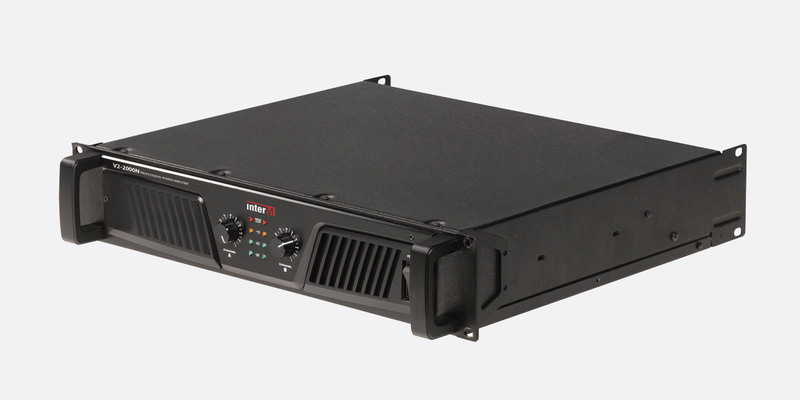 These general purpose low impedance amplifiers from Inter-M offer balanced 3-pin XLR or balanced 6.35mm Jack inputs with Speakon type outputs. These switch-mode amplifiers are force aired cooled with a front-panel intake and rear panel exhaust, whilst offering full short circuit, thermal, and DC output protection along with power on/off muting. The 2U rack-mounting, fan-cooled designs are capable of driving speaker systems of two, four and eight ohms impedance. 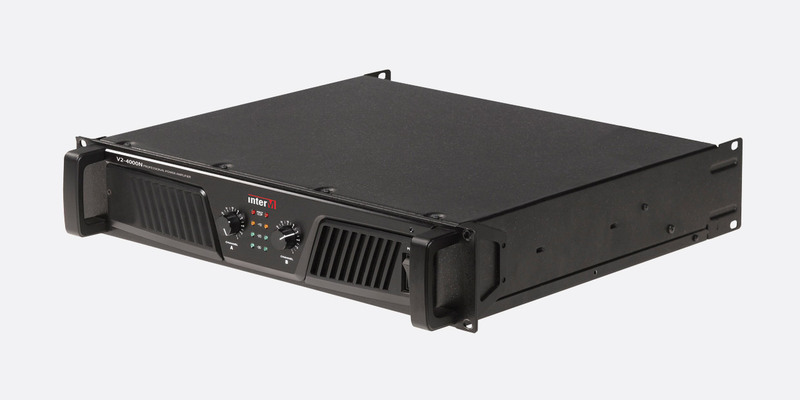 All models incorporate protection circuitry to prevent damage from open and short-circuit loads, heat sink over-temperature, and DC components in the audio signal. The front panel has two cooling vents with screw access for dust filter removal, power switch, and two gain controls. LED indicators are provided for signal presence (green/orange) and signal-clip (red) for each channel, plus AC power (blue). 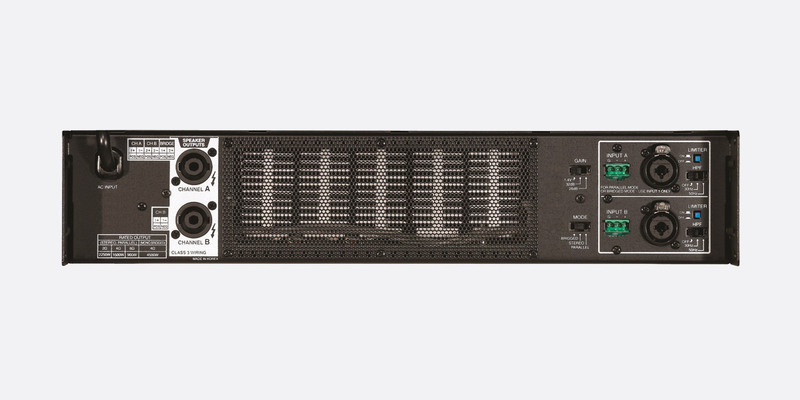 The rear panel has Speakon output connections, one for each channel, along with balanced 3-pin female XLR/6.3mm TRS jack combination and 3-pin Phoenix style connector inputs. Each channel also has an on/off clip limiter switch that reduces the internal operating level of the amplifier to prevent overdriving. 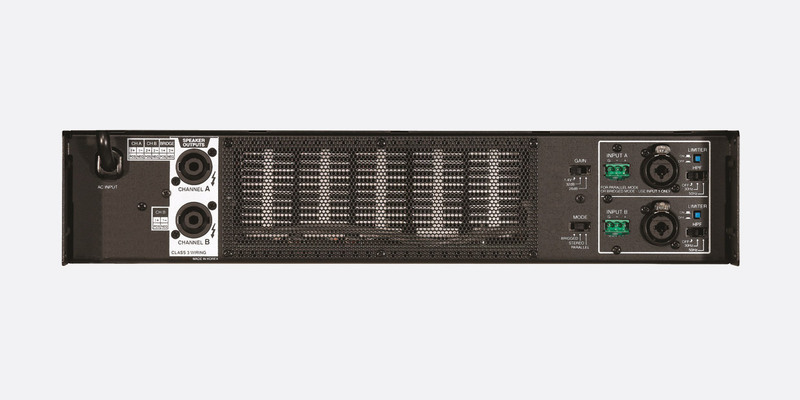 A high pass filter for each channel can be switched between OFF/30Hz/50Hz to help conserve power along with protecting the connected loudspeakers. A single switch allows the user switch between Bridge/Stereo/Parallel modes whilst a final switch can be used to drive the amplifier with alternative gain structures. 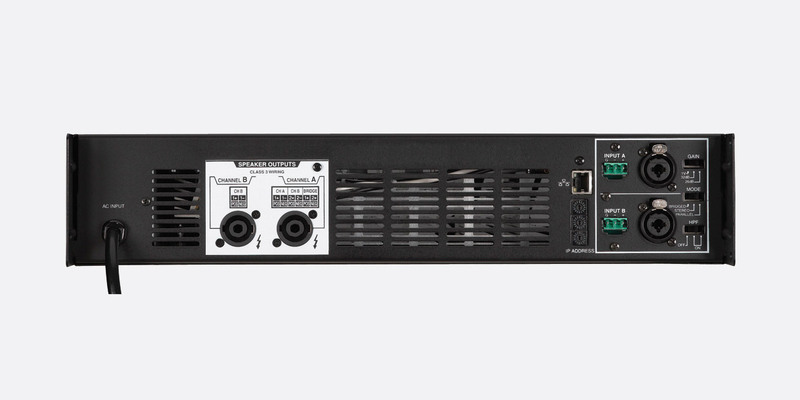 These products have the same amplifier specifications as the above models however they also feature network controllability on TCP/IP network protocol via UTP (Cat-5e) cable. By connecting to a network the operator can monitor and control the amplifier using a GUI.